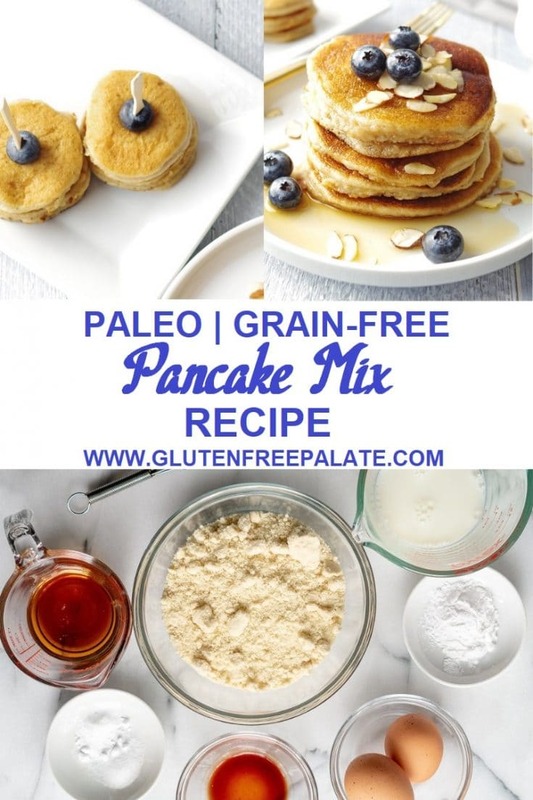 A Paleo Pancake Mix Recipe that is simple to make, a tried and true grain-free pancake recipe, and can be made right away, or stored for future use. 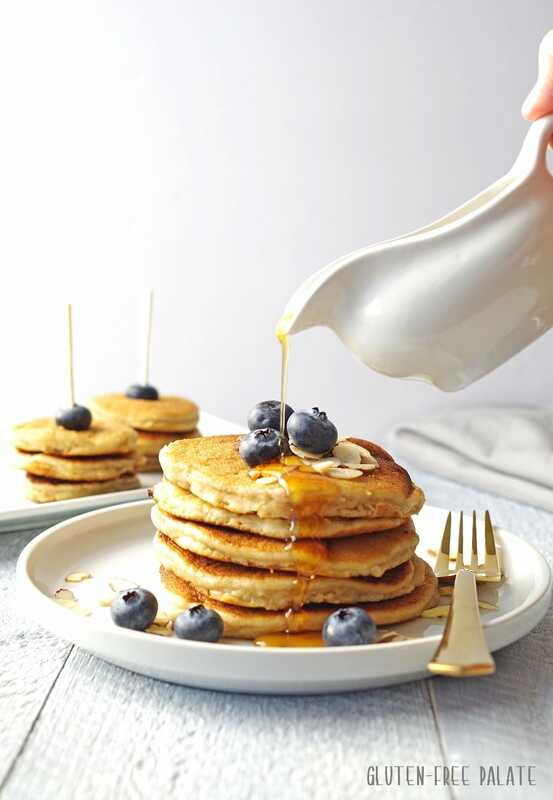 Dairy-free, and refined-sugar free, these paleo pancakes are fluffy and the perfect start to any morning. Vegan option included. 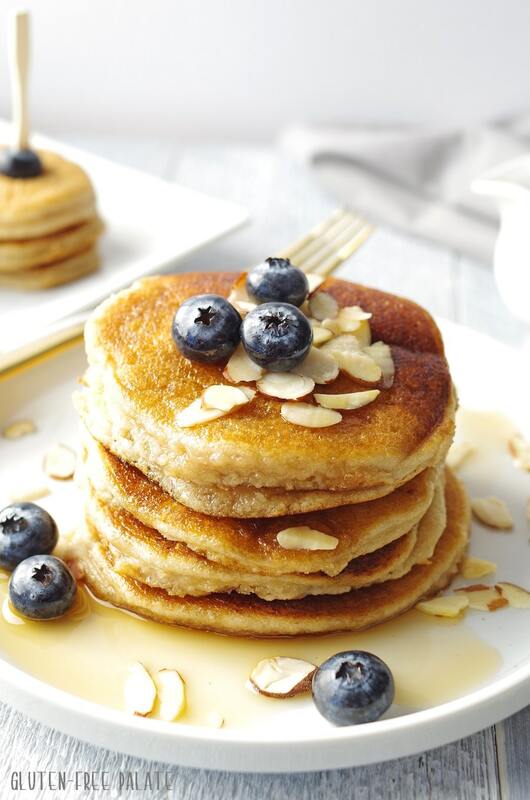 These fluffy grain-free pancakes are also dairy-free and refined sugar free, making them Paleo friendly. They are high in protein and healthy fats, keeping you full longer. With hints of vanilla and almond flavors, they are sure to be a new favorite a breakfast time. Enjoy them plain or topped with your favorite toppings. Everyone loves a good paleo pancake mix, and I love a good paleo pancake recipe. I find paleo pancake mixes to be expensive, so I mix up my own mix and use it anytime I want paleo pancakes. About a year ago I started making the dry portion of mixes in bulk and storing them in glass containers so that my sweet husband and girls could easily make the things they love when was traveling. Since then, we tend to keep this paleo pancake mix recipe close so that we always have pre-made mix on hand. All paleo pancake mixes are simply the dry ingredients combined. You always have to add the wet ingredients like eggs, oil, etc. By making it yourself you can keep as much or as little as you want on hand. Also, it’s saves quite a bit of money if you are making grain-free pancakes every week. We like to make up a couple batches of paleo pancakes and keep them in the freezer for busy mornings. My girls pull them out and re-heat them for a delicious homemade breakfast. If we don’t make paleo pancakes we make gluten-free pancakes using my gluten-free pancake mix recipe. It’s not paleo but it is almond flour free if you can’t do nuts. How long can I store paleo pancake mix? This mix can be stored in an airtight container (or glass container) for up to three months at room temperature. It may stay fresh longer, but I wouldn’t know because we usually griddle our way through the paleo pancake mix before then. For store bought paleo pancake mixes, always check the expiration date printed on the box. Can I use an egg substitute in paleo pancakes? 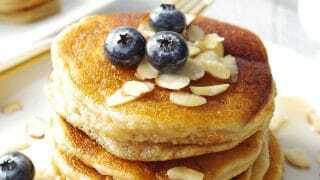 I have used flax-egg and chia seed egg in gluten-free pancakes before. They are delicious, but they don’t get the same rise as you would if you used eggs. 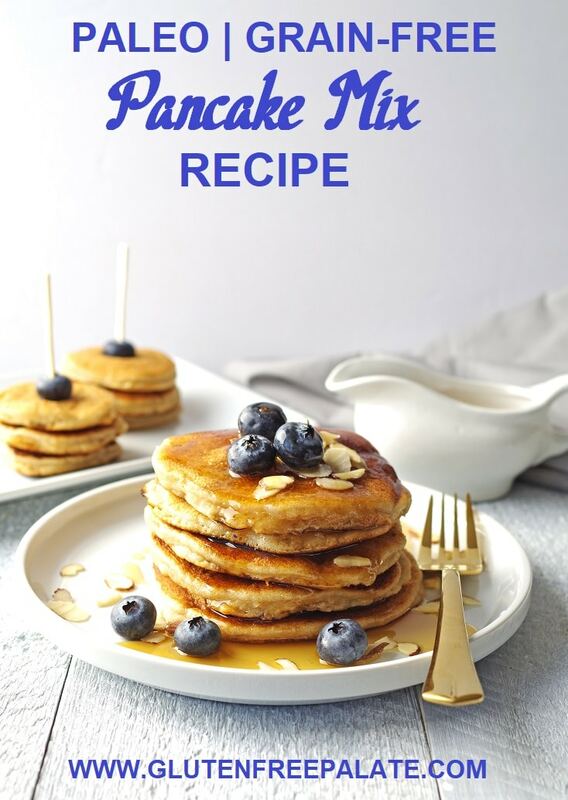 For this paleo pancake mix recipe you can use flax egg or Bob’s Red Mill Egg Replacer. When I make my own mixes and my own gluten-free flour blend, I personally like to store them in glass jars or containers. I feel that they stay fresh longer, and they are a good storage option. Amazon stopped carrying my favorite lids but as soon as I find them again, I will come back and post where to get them. Always follow the recipe first. Don’t work with substitutions until you know how the recipe works. Once your batter is ready, heat your pan or electric griddle. When you are ready to make paleo pancakes: In a large mixing bowl, whisk together eggs, maple syrup, vanilla, and dairy-free milk. Add dry ingredients to the wet ingredients and stir until smooth. If you mixed up more than one batch of paleo pancake mix, measure out approximately 1.5 cups + 1 tablespoon of mix. In weight that’s about 180 g.
Spoon ¼ cup of prepared paleo pancake batter onto a medium hot griddle and cook until the edges start to brown and bubbles form. Flip paleo pancakes over and cook until brown and cooked through. Always check for doneness before you remove your pancake from the pan or griddle. 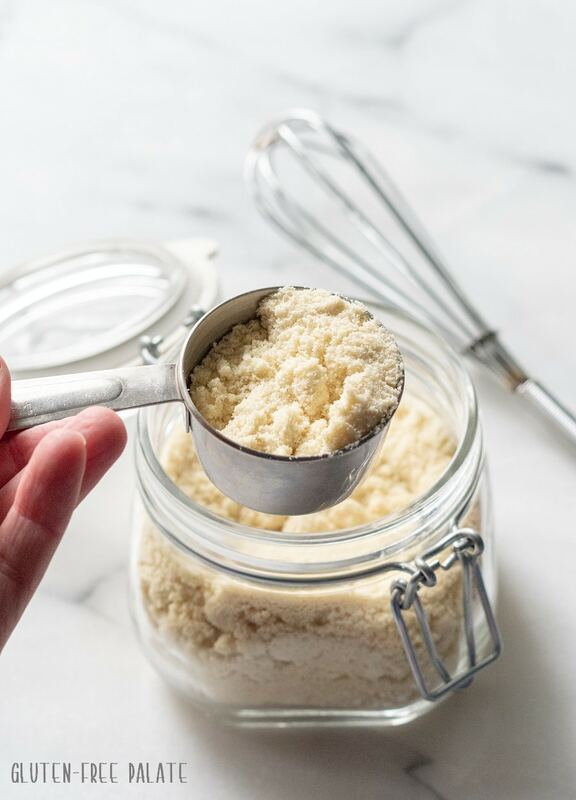 Remember when measuring almond flour to spoon your flour into your measuring cup, then level it. Do not dip your measuring cup into the flour then level, it will be too much almond flour. I don’t always include the weight of ingredients, but I did include the weight of the almond flour for this recipe for you. You don’t need an electric griddle to make paleo pancakes but I find that it’s way easier. For one, you don’t oil an electric griddle. It’s non-stick. Also, the heat tends to stay even throughout the griddle whereas with a pan the heat might fluctuate. Also, you can make 6-8 grain-free pancakes at once on an electric griddle. If you love gluten-free pancakes and want to try some different recipes you might like my Gluten-Free Pumpkin Pancakes or my Gluten-Free Apple Cinnamon Pancakes. Looking for a low carb pancake? 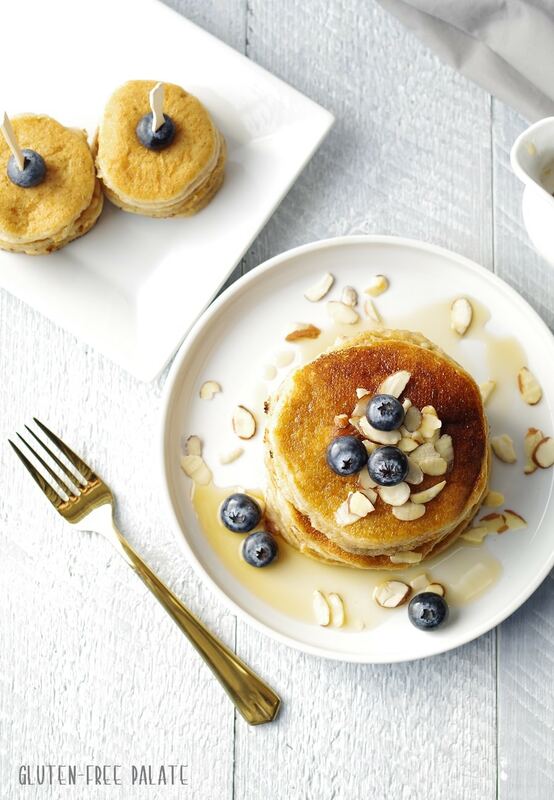 Try Wholesome Yum’s Coconut Flour Pancakes. These Low Carb Pancakes are also scrumptious. Can I freeze paleo pancakes? Yes, you can freeze paleo pancakes. Always bring your paleo pancakes to room temperature first. After they are at room temperature you can store them in an airtight container or a zip lock bag for up to three months. Some people like to place pieces of wax paper or parchment paper between each pancake. I don’t find you need to. Did you make this paleo pancake mix recipe? Please leave a comment below and let me know what you thought! A Paleo Pancake Mix Recipe that is simple to make, a tried and true grain-free pancake recipe, and can be made right away, or stored for future use. Pre-heat a non-stick griddle, or pan. Pour the dry pancake mix into a large mixing bowl. 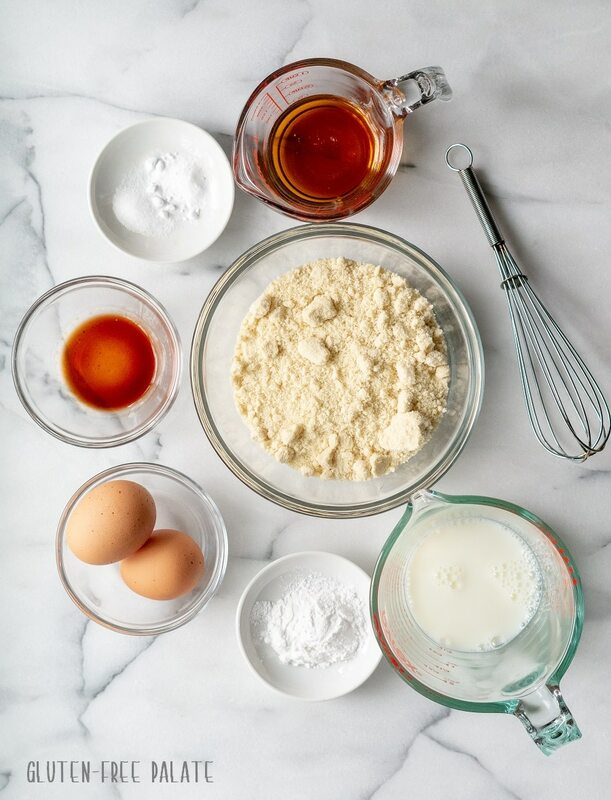 If you doubled or tripled the dry ingredients before storing make sure add enough wet ingredients or measure out one batch worth of dry ingredients to mix with the wet ingredients above. One batch equals about 1 1/2 cups + 1 tablespoon (180g) of dry paleo pancake mix. Spoon ¼ cup of batter onto a medium hot griddle and cook until the edges start to brown and bubbles form. Flip pancakes over and cook until brown and cooked through. This recipe was amazing. It tastes like cake to us – yum! I left out the tapioca flour because I didn’t have any, I left out the maple syrup from the wet ingredients and instead only used it for a topping, and I added cinnamon to the dry ingredients. So glad I found this recipe! Thank you! I am so glad you like these pancakes! Thank you for stopping by and letting me know.